Suspected ear infections or otitis media account for over 35% of all pediatrician visits in the United States – that’s approximately 30 million doctor visits a year. But is a visit to the pediatrician the best way to handle them? Now we have well done studies on which to base our decision. Many people are now turning to Chiropractic instead of traditional allopathic medicine to deal with ear infections for children. Chiropractors attempt to get to the root cause of a health problem rather than just treat the symptoms. Ear pain is the number one reason for child visits to chiropractors. Misalignments of the spine (also called subluxations) can occur during childbirth or from a fall or tumble. Misalignments undiscovered or left untreated can irritate or inflame the nerves and can affect the Eustachian tube, leading to fluid buildup in the middle ear. The purpose of a chiropractic adjustment is to help to restore the normal functioning of the nervous system so the body can heal itself without the use of drugs or surgery. Even the CDC says “antibiotics are not recommended to help treat many ear infections”. A promising study published in the Journal of Clinical Chiropractic Pediatrics indicates that there is a strong correlation between chiropractic adjustments and the resolution of ear infections. 332 children with chronic ear infections participated in the study. Each child, ranging in age from 27 days to 5 years, was given a series of chiropractic adjustments. The results show that close to 80% of the children did not experience another ear infection within the six-month period following their initial visits. In a recent study by ICPA it concludes that Chiropractic care is MORE effective and reduces symptoms faster than traditional allopathic care. The Role of the Chiropractic Adjustment in the Care and Treatment of 332 Children with Otitis Media Fallon, JM. Journal of Clinical Chiropractic Pediatrics Vol 2, No. 2 1997 p.167-183. From the abstract: This pilot study included children from 27 days old to five-years-old, was on the effects of chiropractic adjustments on children with otitis media used tympanography as an objective measure. Results: The average number of adjustments administered by types of otitis media were as follows: acute otitis media (127 children) 4 adjustments; chronic/serous otitis media (104 children) 5 adjustments; for mixed type of bilateral otitis media (10 children) 5.3 adjustments; where no otitis was initially detected (74 children) 5.88 adjustments. The number of days it took to normalize the otoscopic examination was for acute 6.67, chronic/serous 8.57 and mixed 8.3. the number of days it took to normalize the tympanographic examination was acute: 8.35, chronic/serous 10.18 and mixed 10.9 days. The overall recurrence rate over a six month period from initial presentation in the office was for acute 11.02%, chronic/serous 16.34%, for mixed 30% and for none present 17.56%. The results indicate that there is a strong correlation between the chiropractic adjustment and the resolution of otitis media for the children. Note: 311 of the 332 had a history of prior antibiotic use. 53.7% of the children had their first bout of otitis media between the ages of 6 months and 1 year and a total of 69.9% of the subjects in the study had their first bout of OM under a year of age. This is consistent with the findings of other studies. Even though this study is not definitive and more scientific research needs to be done in this area, chiropractic treatment is a conservative, drug-less approach to consider trying if your child has a history of chronic ear infections. Another Natural Remedy that Works!! The fastest way is to heat the olive oil in a small pan or double boiler (preferred) and add the minced garlic. Then, keep on very low heat for about 20 minutes to let the beneficial properties of the garlic infuse into the oil. At this point, strain the garlic and remove. Let the garlic cool to just skin temperature and place two drops in the ear. The warmth and the oil often offer fast relief. Since fresh garlic is used, I make a new batch of this mixture every 24 hours if needed rather than keeping the remaining oil, since bacteria can potentially grow from the garlic. 2. For stubborn cases parents can drop a little vinegar in the ear (and then drain it) to help cleanse the area. 3. and often removing dairy from the diet helps so the mucous membranes do not feel overly taxed and this allows the child to get ahead of the infections. If this can help someone else, please Share it! 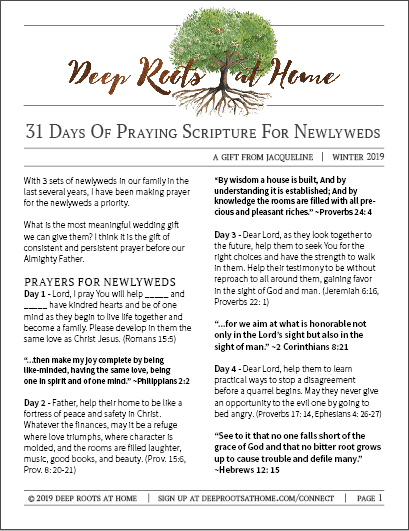 If you’ve been encouraged or informed by something you’ve read here at Deep Roots, please consider liking my page on Facebook, joining us on Pinterest, or subscribing to the helpful email resources. Thank you! Chiropractors can help so many things in our bodies. My cousin was n X-ray technician many years ago. Went back to school after her 2 girls were born and made a chiropractor. She is in her late 70s and still has her practice. I pray you are well, dear one! and at a great cost all the way around. Great post. Thanks for sharing. Any recommendations on a good chiropractor in Northern NJ? I have a 5 yr son and would like to take him to a chiro. Hello, Swarna 🙂 Here is the U.S. Chiropractic directory: http://www.uschirodirectory.com/ Maybe it will be helpful. Hi, this is so informative and makes a lot of sense. I am going to try it! This blog contains affiliate links. To view our disclosure and medical disclaimer, click here. Come, explore using essential oils for yourself for less. I would love you to join me, Jacqueline, in becoming a wholesale member. Young Living oils strengthen body and mind! Learn more & April sales. We all want to stay happy and healthy this winter! 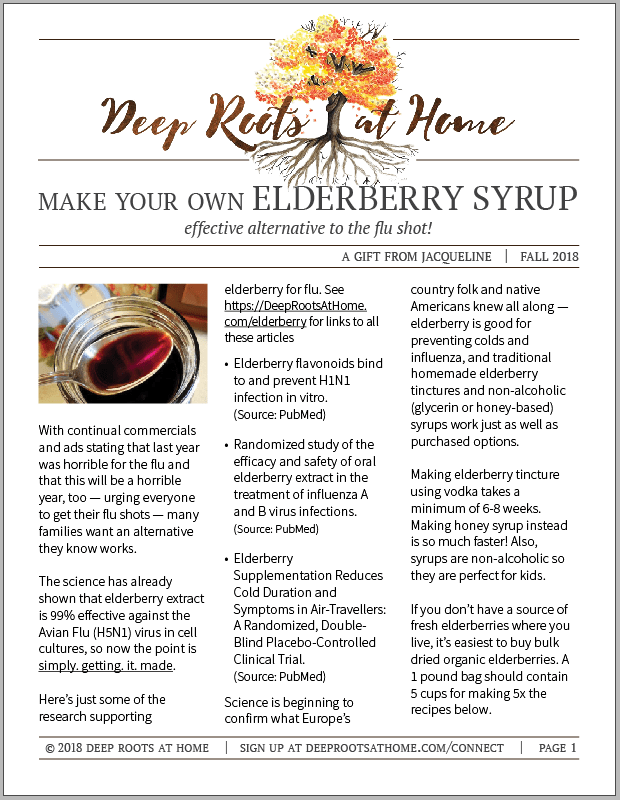 Receive this important freebie: “Make Your Own Elderberry Syrup — with Easy Recipes!” printable PDF for you and your family. You’ll also get a coupon code for 15% off Sweet’s Elderberry Syrup if you don’t want to make it! The PDF will arrive in your inbox! You’ll also get about 1-2 emails a month (including the seasonal freebies!) and can unsubscribe at any time. When it comes to vaccines, we want to know the facts, not someone’s opinion. Receive this important freebie: “Vital Vaccine Info” printable e-book for you and your family. The e-book will arrive in your inbox! You’ll also get about 1-2 emails a month (including the seasonal freebies!) and can unsubscribe at any time. • “Dyslexia Tips” ebook with practical advice you can use right away! Your resources will arrive in your inbox! You’ll also get about 1-2 emails a month (including the seasonal freebies!) and can unsubscribe at any time. We’d love to keep in touch! And you’ll receive the important freebie of the season: “Starving Brains & Poor Attention Spans in Boys: 30 Tips for Parents” printable PDF. We’d love to keep in touch! And you’ll receive the important freebie of the season: “100 Whole-Hearted Books to Take Back the Culture” printable PDF. ¡Nos gustaría mantener en contacto! 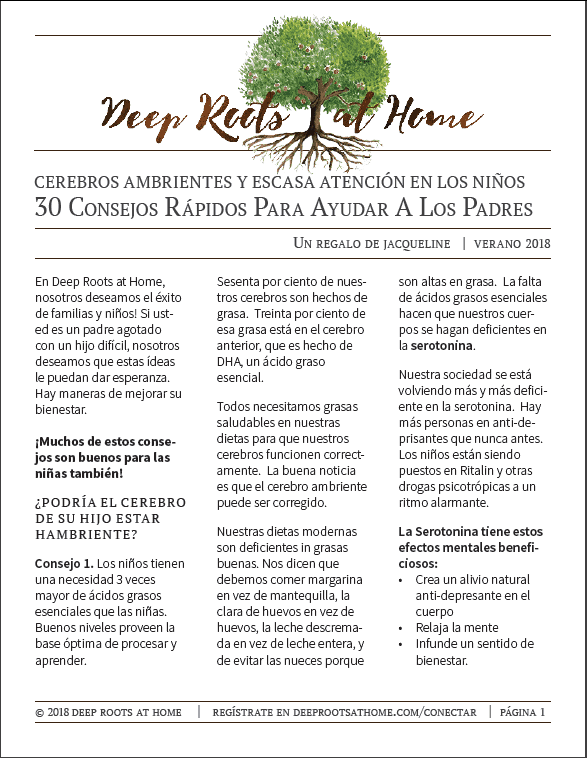 Y usted recibirá un obsequio importante de la temporada: “Cerebros Ambrientes y Escasa Atención En Los Niños” PDF imprimible. Ver nuestra política de privacidad. ¡El PDF llegará a su buzón de entrada! ¡Usted recibirá 1 – 2 correos electrónicos al mes (incluyendo los regalos de temporada!) y puede cancelar su suscripción en cualquier momento.